St. Mary’s University pulled off a clean sweep at the National Collegiate Leadership Conference (NCLC) Case Study Competition last week. 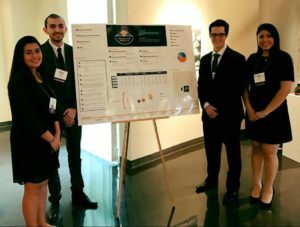 Greehey School of Business teams took first, second and third place at the national case competition Feb. 17-19 at the University of Arizona. Greehey Scholars Kimberly Rodriguez, Alex Gavin, Samuel Santos and Aime Navarette-Reyes won first place. The second-place team included Hannah Odom, Paige Weiss, Maria Barragan and Allison Dauphine. Professor of Marketing Mathew Joseph, Ph.D., coached the team. Third place went to a team of freshmen: Greehey Scholars Julia Kheiv, Benjamin Hoffman, Ryan Smith and Rudy Martinez. But that’s not all St. Mary’s students accomplished at the competition. Greehey Scholar Guillermo Avelar also earned recognition and won a Best Presentation award. The teams worked hard during the week to formulate innovative solutions to the case study problem, said Oliva, who helped prepare the students for the competition. The NCLC is an annual, student-run conference that provides leadership training for hundreds of college students across the nation.